NVIDIA Direct3D SDK is a collection of DirectX 11 code samples which compliments the latest line of NVIDIA GPU products and graphics adapters. The SDK includes a number of interesting samples of how to create 3D graphics with Microsoft DirectX 11 including motion blurs, anti-aliasing, FXAA, shadows, filters, etc. 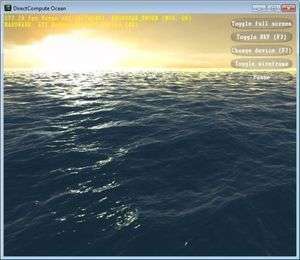 NVIDIA Direct3D also includes ocean rendering. The collection download is rather large and an excellent set of examples on how to code with some of the newer techniques. Version 11.0.328.2105 is a freeware program which does not have restrictions and it's free so it doesn't cost anything. For security reasons, you should also check out the NVIDIA Direct3D SDK download at LO4D.com which includes virus and malware tests. Additional screenshots of this application download may be available, too. Providing access to software downloads geared towards software developers including software development kits (SDK), .Net and ActiveX components and database tools. Check out some of the freeware downloads available in the developer tool category. They contain no strings and are available at zero cost. 4 out of 5 based on 72 ratings.